The ideas of Agile are great. It’s the way it has been codified into rituals and certifications, and rolled out mindlessly that misses the point. That’s three mindsets corrupted by the unthinking masses, who’ve grabbed onto a tantilising promise of something better, and followed the steps without really thinking it through. People have a real need to change, but they get stuck following rules or process without really understanding why. Design Thinking is about ability and learning. Carissa Carter, head of teaching at Stanford Design School, brilliantly describes some of the abilities that make designers great. Abilities like dealing with ambiguity, empathetic learning, synthesis, and experimentation, among others. A designer’s ability to make meaning, frame a problem, and explore potential solutions are key. Donald Norman, author of The Design of Everyday Things, describes a designer’s discontent with the first idea. Ask yourself, when was the last time that your first idea was your best idea? Meaning and new ideas emerge when we explore things. Design Thinking is simply how we explore those problems and solutions. Everyone designs, whether it’s conscious or not. If you’re solving a problem, you’re designing a solution. Design Thinking is a mindset that helps us do it better. Lean started out as a response to scientific management practices in manufacturing. Organisations sought efficiency through process, rules, and procedures and management was mostly about control. But in modern business, control is a falsehood. Things are too complex, too unpredictable, and too dynamic to be controlled. Lean offers a different mindset for managing any system of work. It’s fundamentally about exploring uncertainty, making decisions by experimenting and learning, and empowering people who are closest to the work to decide how best to achieve desired outcomes. Lean says be adaptive, not predictive. The real benefit comes when we bring all three mindsets together. Too often, the question is “lean or agile?”. The answer is “and”, not “or”: it’s Design Thinking, Lean, and Agile. That’s easy to say, but how do we do it, and what does it look like in practice? 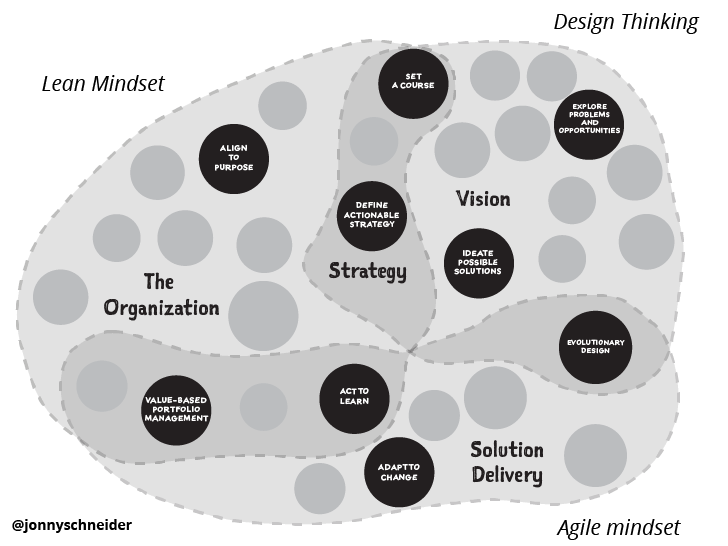 Here’s some lessons learned from applying Design Thinking, Lean, and Agile in the wild. Building a product is a lot like a combat mission. A team of skilled people operate in conditions of high uncertainty; a commander sets clear outcomes with some guiding principles; but we expect the unexpected; and, we’re trained to take best action, responding to new information as the situation unfolds. In military operations, it’s called disciplined initiative, and soldiers train so they can practise the movements of combat. In Mike Rother’s Improvement Kata, it’s called deliberate practice, and it’s how we practise the movements of scientific thinking. This is how product teams can align to purpose, explore uncertainty, and learn their way to achieving desired outcomes. Pro tip: Try visualising the whole end-to-end process, from aspirations and hypotheses to design experiments and feedback on a big product wall, so that the whole team can play along together. We all know that vanity metrics – like total page views, or total new customers – are pointless. But knowing what not to measure doesn’t make measuring the right things any easier. Even with the right motives, there are lots of ways we get it wrong. Suppose you’re operating an online store selling tens of thousands of unique items to all kinds of buyers. 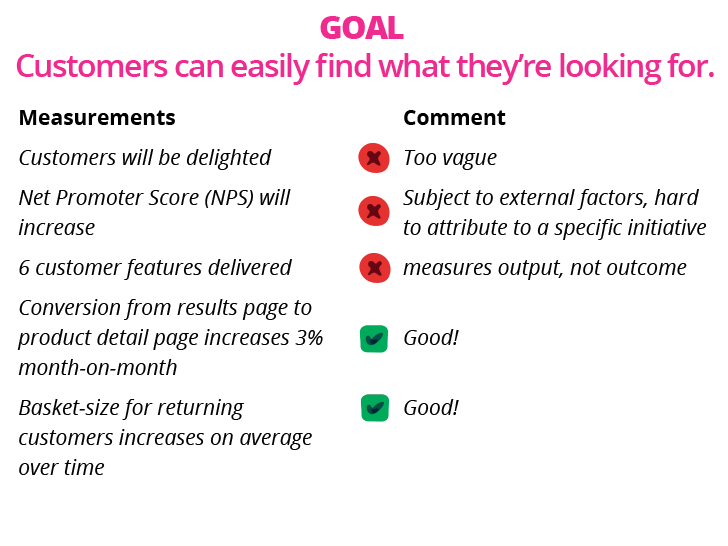 Making it easier for them to find what they’re looking for is one of your goals. Now try breaking that goal down into metrics that help you know if you’re on the right track. Pro tip: Structure your metrics around future decisions you want to make. Only measure things that indicate progress toward your goal. Hypothesis Driven Development offers a way to frame outcomes, beliefs, and metrics in a simple, repeatable format. It gives some structure for finding the right metrics, and makes it easy to communicate to others. Why do we learn? To make better decisions. Many solutions fail because they solve no meaningful problem, and we tend to fall in love with our ideas and let our biases get the better of us. Even when we try to de-risk our decisions by testing our ideas and running experiments, we don’t always get it right. 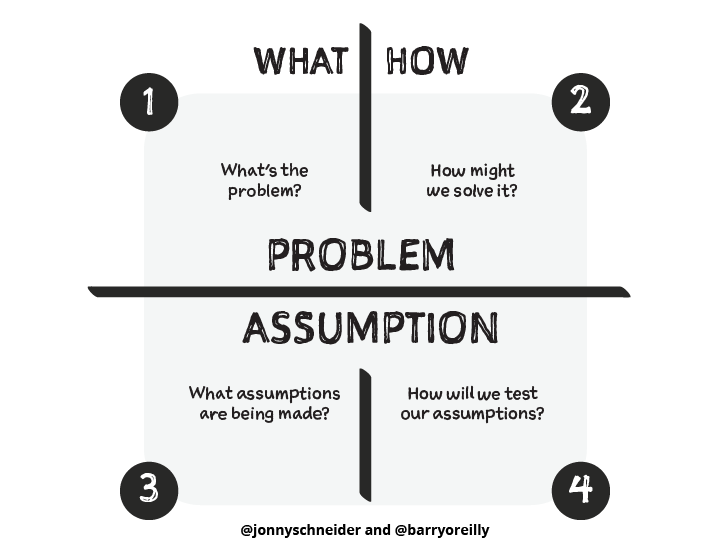 One trap is to conflate a good prototype test result with strong affinity for the problem, or customer demand for the solution. Each of those – problem, solution, demand – are separate concerns, and they require different learning approaches. Instead of focusing on applying a process, teams ought to challenge how they think and try new things, embrace the things that work, and learn from the things that don’t. This right way will be different for each team in their own specific context. Success is about how teams develop new ability, learn by doing, and adapt to what is learned. Pro-tip: Try Jeff Patton’s Dual Track Development. It describes how teams can bring product discovery and product development closer together into one collaboration.